Aid-donor agency Petrocaribe has dispensed funding dollars to begin restoration work on Palace of 365 Doors in Petite-Riviere, Artibonite, part of Artibonite North Department. The Palace was designed by architect Louis Dupeyrac as a presidential home for King Henri Christophe in 1820. Christophe commissioned the project because he wanted a potent symbol of his dominance over the abundant and verdant agricultural lands of the Artibonite plains. For unknown reasons the palace was never completed. Over a century later, the abandoned building had deteriorated significantly. Under President Stenio Vincent, funds were allocated to restore Palace of 365 Doors in Petite-Riviere, Artibonite. Restoration work included laying corrugated steel floors, spreading a layer of cement over its exterior surface, and covering windows with wood shutters. Not a true restoration, it was done to stop any further deterioration and shield it from the elements. Since then the building has been used as lodgings for Haiti's National Security Volunteers under Jean-Claude Duvalier. Most recently it was home to an elementary school and some national and local government offices. In 1995, the government of Haiti (GOH) publicly announced they were registering Belle Rivière as a National Heritage site. 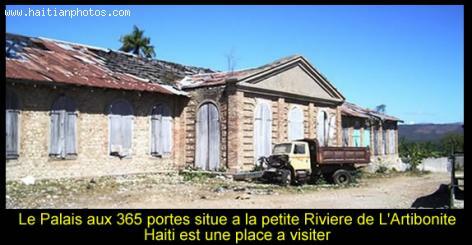 In 2007, an alliance of artists representing SOS Heritage began a fund-raising campaign for the full restoration and preservation of Palace of 365 Doors in Petite-Riviere, Artibonite. The preservationists annually hold an arts festival featuring performing arts as well as literary events. The GOH has finally begun restoration work on Palace of 365 Doors in Petite-Riviere, Artibonite because they realize its potential to draw increased tourist dollars the country urgently needs. Restoration work began on May 7th.